I've been doing a lot of reading again this month, but rather than novels its been cookery and lifestyle books that I've had a taste for. As you know food and lifestyle are just as important, if not more so than fitness when it comes to improving your health and fitness. So, this month I've been pawing over these books to arm myself with the knowledge and motivation to keep going when I feel like falling off the wagon. This book has been out for a while, and just before it was due to be released I read excerpts in a copy of You magazine. Usually I don't buy into the whole celeb self improvement stuff, but something about the way and the knowledge the Body Book is written with stuck with me and prompted me to purchase. Written by Cameron Diaz and Sandra Bark, the book is split into three parts, nutrition, fitness and mind. Each section encourages you to consider how it is linked to the overall picture, how you can't achieve total success unless you do all three elements (eat right, exercise and state of mind) and goes on to break it down into the biological impact and effects, and explain and clear up any confusion as to why each element is just as important as the next. The book talks about macros vs micros, the benefit of sweating each day and how to train yourself out of bad habits and into good ones. There is a lot of research and education in the book, and quite frankly even though I didn't read it in one sitting, it was easy enough to pick up and read - I even highlighted passages I knew related to me the most. All in all I've found it a really interesting read and one I can see myself picking up and reading parts of on an ongoing basis. When I bought this book last year, I think I was a bit confused as to why I was buying it. I think I thought it was more of a lifestyle, nutrition and advice book, which although there is some stuff up front, it's not really. What it is is a cookery book which advocates healthy eating, and shows that it doesn't have to be boring and bland, you don't need to diet and gives you some upfront information into why some foods are so great, why you should cook with some ingredients over others etc. There are some really tasty recipes in here too, I've made a few but I've flagged a lot more recipes I want to try. For me it's just getting into the right mindset. For instance they talk about the health and healing properties of bone broth - which really is stock, and I know that, but calling it bone broth is really off-putting to me. Stupid I know, but it's things like that that have prevented me trying a few more dishes than I'd perhaps like. It's also a habit thing, as Cameron Diaz says, it's about reprogramming your thinking into new ways to help better yourself (paraphrasing), so now it's just about practising what I've read in the kitchen. 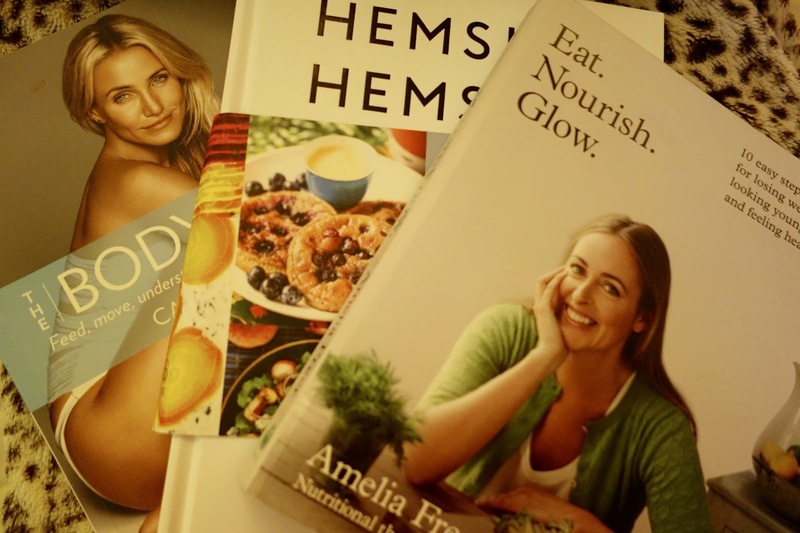 Amelia Freer who is the nutritionist and healthy eating expert behind this book and I'm a fan. I bought this after I bought Hemsley Hemsley and I really enjoyed reading this, so much so I also read it on my commute. I pretty much devoured this book cover to cover and found it really interesting. Although there are some food recipes in here (and one in particular that I love making - the Chicken Arrabiata), this is more about understanding the benefits of eating well and the impact it can have on everything from your energy levels to losing wright and improving your overall appearance. I totally bought into this book, the way she explains things and how she talks about how she used to be, what she used to eat when she first started working in the city, and how she began her discovery into nutrition. She also talks about it being a process and not being hard on yourself, instead it's about giving up a little something extra each time. For me this is a great book to start thinking about nutrition, the benefits of certain foods, the effect things such as sugar and alcohol can have, along with multiple other things. OK, so there you have it - what I've been reading and looking to action lately. These are only a few of the books out there of course, but I've personally been enjoying reading and soaking up some of the information that's out there, allowing me to better arm myself with information to make my health journey a more effective and productive one. Even a small step in the right direction is a huge improvement to one in the wrong direction.